Gateshead chairman Graham Wood has labelled playing in the Conference Premier as "financially unsustainable". The former Sunderland director bought Gateshead in 2007 and three years later turned the club professional. But they rarely draw four-figure crowds to their International Stadium home. In Conference Premier this season, Gateshead have averaged crowds of 755 for their home games. On Wednesday their FA Cup clash with Oxford was postponed because of a waterlogged pitch - the club had sold over 1,500 tickets in advance. He told BBC Newcastle: "This league is financially unsustainable - I'm having to bankroll the club. It's a terrible league to be in and promotion would be worth around an extra £1m a season." In September, and thus far has overseen a marked turnaround in the club's fortunes. Gateshead have not played in the Football League since 1960, but after eight wins in 13 games since Mills took charge, they sit just two points outside the play-off places. "We're still going to move to a new stadium, it's just taking longer than we had hoped," Wood explained. "Gary has transformed the side on the pitch and I think as a club we can sustain a new ground in the Football League. "I think our squad is good enough we just need a bigger income - when I turned the club professional it increased the wage bill by 30%." 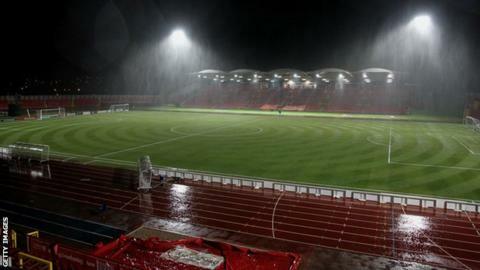 Meanwhile, Gateshead's FA Cup replay against League Two Oxford United has been rearranged for 5 December. Wednesday's game was called off because of a waterlogged pitch.